The Old Coupland Inn & Dance Hall first opened its doors in 1906 as the Coupland Mercantile Company. The building later housed the Albers Drug Company. Plenty of doctors, dentists, and even a telephone company have called the establishment home. In 1991, the owners at the time–the Worthys–created a Texas-sized dance hall from space previously occupied by a store. The new Coupland Dance Hall held two bars, a dance floor ready for musicians, and a big crowd. Soon after, the Worthys fired up the pit and out came delicious barbecue, born from family recipes. The ribs, pork, and brisket gained popularity as the perfect way to start a night at the inn. In 2017, The Old Coupland Inn & Dance Hall found a new owner in Abbey Road. The Worthys sold the business and property for a well-deserved retirement. After 34 years, The Old Coupland Inn & Dance Hall was about to go through a world of new. Road has a special place in her heart for dance halls. She spent eight years as talent manager for one of Texas’ oldest dance halls in Luckenbach, made famous by the Waylon Jennings song. The sights and sounds, the feeling of community, and the fun to be had are all dear to Road. The Worthys couldn’t have picked a better owner. All Road’s success and experience in Luckenbach led her to buy Coupland in a heartbeat. She’s aiming to bring the love experienced in Luckenbach to Coupland, and has been working tirelessly since she gained ownership. Road’s experience results in a high level of music curation. She’s particular about the bands she showcases. They have to have a certain level of professionalism, fan following, and be able to play quality tunes. The results of this criteria were evident during the weekend I spent at Coupland. I wasn’t aware before booking my stay that nine-time Grammy winner Asleep at the Wheel was performing that Friday night. Country music isn’t my forte, but the atmosphere was contagious and I had a rollicking good time. Road expects the same standard from the service and food. Start out with the brisket-stuffed jalapeño poppers–they’re the crunchiest I’ve ever had. The brisket is mouth-watering and the pork ribs could make a nun swear. They’re that good! The two are even better with the delicious, homemade blueberry BBQ sauce. The coleslaw is fresh and the potato salad is rich. The servers are friendly and super helpful. So you’ve decided to check out Coupland. Great! Now the big question: where do you get some quality sleep after a night of dancing and drinking? Right there at Coupland, of course! 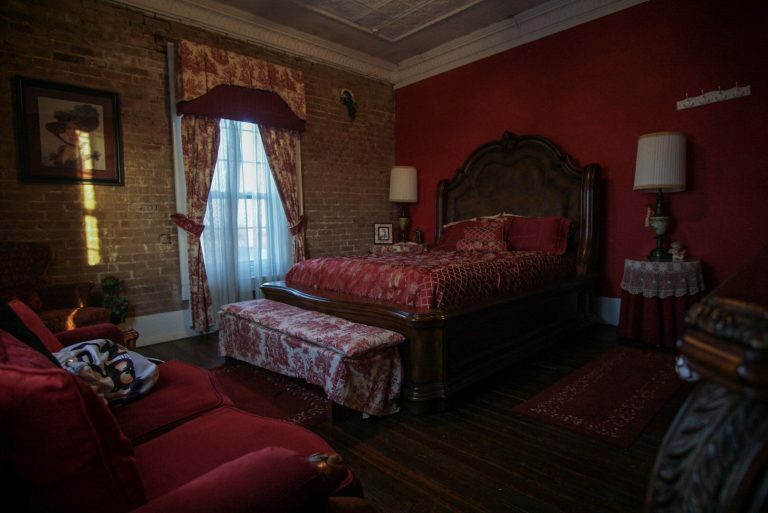 The old-timey inn is home to seven rooms with classic decor. Lodging is right above the food hall, making this an ideal spot to crash. As you enter the lodging area, you’ll be greeted by a large, common room with plenty of couches, television, and several board games. The rooms line the outer edge of the common area. Rooms are $135 per night. There are no assigned rooms–you simply pick one when you arrive. You’ll find a small kitchen and a shared bathroom with shower stalls. The Old Coupland Inn & Dance Hall has gone through several lives before arriving at its current avatar. Abbey Road is carrying on the legacy of this beautiful building, while inserting her spin. She’s been hard at work, breathing new life into old bones and creating an experience worth your while. Next time you’re making weekend plans, consider visiting The Old Coupland Inn & Dance Hall.